While many of us might be experiencing some “holiday gains” in the wrong places, weight gain isn’t always something that you should be afraid of. Take actress Emma Stone, known for her roles in La La Land, Easy A, and Superbad. For her 2017 role as tennis star Billie Jean King in Battle of the Sexes, Stone needed to tone up to more closely resemble her real life character’s muscular physique. Stone had just three months to achieve the right look. 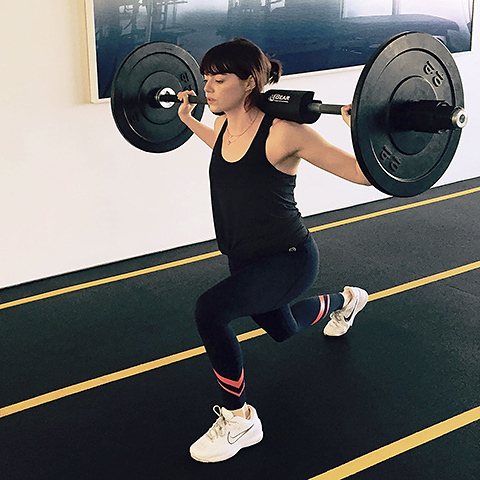 She turned to fitness trainer Jason Walsh, who has worked with Matt Damon, Emily Blunt, and Bradley Cooper, to name just a few of whom he has prepared for various action roles. Walsh devised a plan that included increased calorie and protein intake along with full body weight lifting routines. Stone’s workouts consisted of farmer’s walks, hip thrusts, weighted lunges, deadlifts, pushing and dragging sleds, and weighted push-ups among other strength building movements. She worked out 3-5 times a week, and twice a day on some days. Walsh says that Stone came to him weighing 112 pounds and started filming her movie at 130 pounds. She arrived with a petite, dancer’s physique and left with 18 pounds of muscle packed on. What’s even better is Emma was hooked on strength training even after filming. “I want to feel like this, I want to look like this,” says Stone. There are a few relevant take-aways from Stone’s experience. 1. Don’t fear the scale. Many people are disappointed to see gains in weight. The scale doesn’t tell you whether that increase is from fat or muscle. How your clothes fit and how you perform in your workouts is a better indicator of your health and fitness. 2. Women don’t need to worry about bulking up. Stone trained hard for 90 days for her role and modified her diet under the close supervision of a personal trainer. She added muscle, but did not end up looking bulky. Her muscle tone was normal and natural looking. She would have had to ramp things up much harder if she wanted to get giant biceps and quads. Getting huge requires intense workout and diet discipline. If you don’t want to look bulky, don’t worry, you won’t. 4. Focus on strength training. Walsh’s program centered around weight lifting. Cardio was a component of his plan, but the bulk of the program involved pushing, pulling, lifting, and pressing iron. You can run nowhere endlessly on a treadmill, or see real body changes by lifting weights. Stone on the set of Battle of the Sexes. 5. You are capable of seeing results in a short amount of time. Emma transformed herself in just three months. We have seen similar results in Challenge participants at CFF in the same timeframe. Stone’s story is nothing special. With consistency of workouts, and discipline in eating, any of us can achieve a similar transformation. Need a little direction and motivation to help you reach your goals? We’ve got that covered. Keep tuned to Facebook and watch your emails for announcements for healthy eating challenges, special programs, and clinics, coming soon in 2019.